- Hello, Base Camp! Do you hear us? - Yes, where are you? Hello, hello! - On the summit. We are on the Summit!!! - If it wasn't for Everest, we would never have dreamt of climbing here! Two years before, on the 16th October 1978, Wanda Rutkiewicz became the first Pole and the first European (third woman in the world) to reach the summit of Mount Everest. However great success it was, it just inspired to set up more ambitious goals. 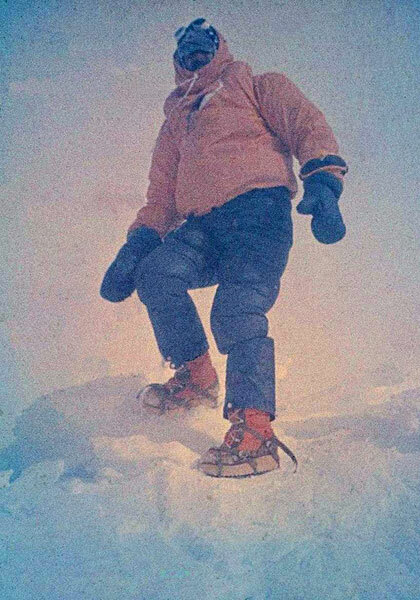 At the time, the majority thought that climbing Mount Everest in winter was impossible. Everyone except Poles :-). Andrzej Zawada’s vison came first. This and - probably - insistence of Józef Nyka who reminded that every 8000-meter peak was conquered during summer but none in winter conditions. Nyka suggested that Himalayan winter should be a target for Polish expeditions. Andrzej Zawada had proved to be a great head of expeditions to the high mountains. He was in charge when Poles conquered Noshaq (7492 m) in the winter of 1973. Then 1974 year came and expedition to Lhotse. Andrzej Zawada and Andrzej Heinrich reached altitude 8250 m.a.s.l. during this expedition, setting the new winter world record. Polish mountaineers thought that human body can handle the winter conditions at such altitudes. The preparations for the first Polish winter ascent of Mount Everest (8848 m) started in 1977 when Zawada started the efforts to get the permit from Nepali authorities. At this time only vinegar (and vodka!) could be found on shop shelves in People’s Republic of Poland... However, the organizers miraculously managed to arrange almost everything. Only mountaineers came in abundance. Team consisted of 20 climbers (Andrzej Zawada ( expedition’s leader), Józef Bakalarski (cameraman), Leszek Cichy, Krzysztof Cielecki, Ryszard Dmoch, Walenty Fiut, Ryszard Gajewski, Zygmunt A. Heinrich, Jan Holnicki-Szulc, Robert Janik (doctor), Bogdan Jankowski, Stanisław Jaworski (cameraman), Janusz Mączka, Aleksander Lwow, Kazimierz W. Olech, Maciej Pawlikowski, Marian Piekutowski, Ryszard Szafirski, Krzysztof Wielicki, Krzysztof Żurek) and 5 Sherpas (led by Pemba Norbu). On the 5th January 1980 the team set up Base Camp on the south face of Mount Everest. Expedition members chose a normal route from Nepal. Initially it was a piece of cake. In 10 days climbers have estabilished Camp III on 7150 m. They couldn’t understand why nobody had climbed Mount Everest in winter so far. And then the wind began to blow. Poles didn't have such precise weather forecast as we have today. They tried to go up and retreated if was too cold or too windy for summit attack (usually it was). After one month of the expedition there were just a few climbers left in shape to attempt the summit attack. On the 11th February Krzysztof Wielicki, Leszek Cichy and Walenty Fiut put up a small tent on the South Col. After a hard night - when the wind almost destroyed their shelter - they retreated (Wielicki to Camp II, Fiut to Base Camp). On the 13th February Andrzej Zawada and Ryszard Szafirski in heroic attempt climbed up to to South Col, where they spent the night. Zawada was exhausted, but his bravery encouraged young climbers. 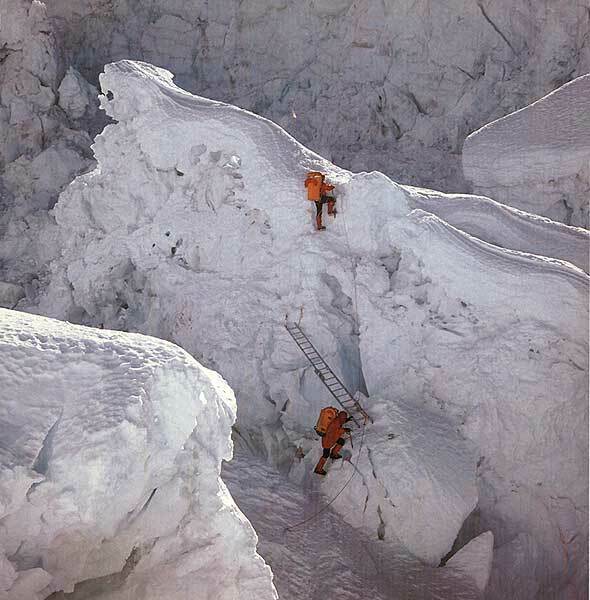 Leszek Cichy and Krzysztof Wielicki decided to try to get to the summit. 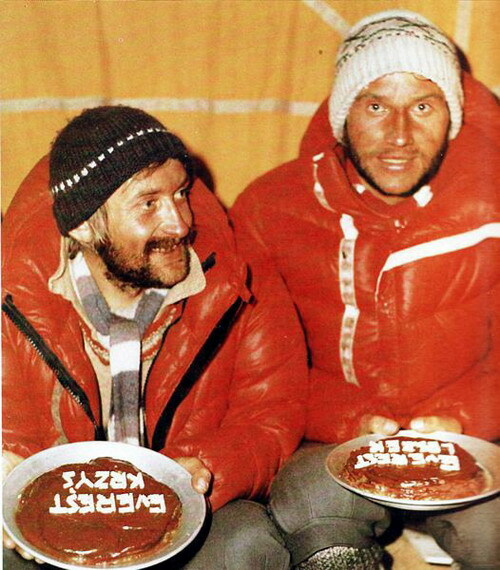 But there were still Andrzej Heinrich and Passang Sherpa in the camp above them. Heinrich was an old hand of Polish climbing. Always very careful. Maybe that was the reason of his retreat along with Passang from 8350 m.
On the 16th February, Cichy and Wielicki reached the South Col. The night was very hard with -42C and strong wind. They ate fruit jelly, lyophilized veal chop and some... old bread (which they found on South Col). On 06:50 a.m. they started the summit push with light packs (only one oxygen tank per person). The right side of the south ridge was easier to climb due to lighter wind. However, higher they had to cross to the left, where the gale was horrible. At 2:25 p.m. they reached the summit and left there a small cross and a rosary blessed by the pope John Paul II. Cichy took some small rocks from the summit along with a piece of paper with and advertisement: "For a good time call Pat Rucker 274-2602 Anchorage, Alaska, USA". Probably ”good time” had a lot in common with prostitution :-). This card was left by Ray Genet (mountaineer who ascended Everest in 1979 but never returned to Base Camp). Wielicki and Cichy also left a thermometer on the summit to measure the minimum temperature. They took some snow samples for scientists. The descent usually is more strenuous and dangerous than ascent. Climbers are exhausted and mistake can lead to fatal consequences. Wielicki’s toes were frostbitten and he was moving very slow. Climbers didn’t have flashlights. Leszek Cichy reached tent on South Col first and waited for Krzysztof. One hour later he arrived there. Team spent a night rescuing Krzysztof toes. Next day the two descended to Camp III, where they met the other members of the expedition. The champions were back in the Base Camp on 19th February. The atmosphere in BC couldn’t have been better. Everybody knew that each of them played an important part in this success. News about success soon reached Poland (through the radio station in Base Camp). First winter ascent of Mount Everest by Andrzej Zawada's team was also the first successful winter expedition to any of the peaks above 8 000 m. After 1980 Poles did nine first winter ascents on 8000 metre peaks. Only two mountains remain unconquered in winter conditions: Nanga Parbat and K2. Krzysztof Wielicki ascended all fourteen 8000 metre peaks (as the fifth personever). Great thanks to Ola Leszczyńska and Tomek Mucha for proofreading!